This is an open singing session for all ages. A desire to sing is all that is required of participants. We sing from the The Denison version hymnal called The Sacred Harp. Loaner copies are available. We sing around a hollow square in 4 parts. Bass Tenor Alto and Trebles without instruments. This style is considered an American Folk Gospel Tradition that is spreading around the world with each singing group independent of each other. The music notes are in the shape of a square, triangle, circle and diamond - this is why it is called shape note singing. 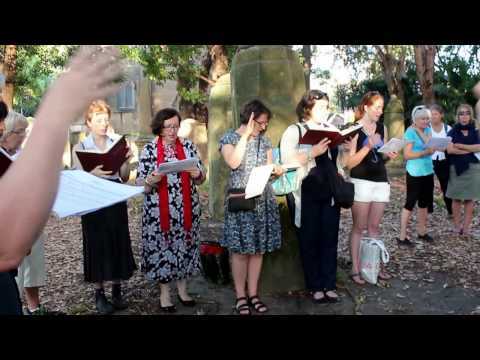 Visitors from other singing groups are welcome to join us on a regular or irregular basis. Admission is free - there is an opportunity to make a free will donation to help defray costs. We meet on a Wednesday evening from 7pm to 9pm from the first week of February till the end of October each year. There is a break for 2 weeks at the beginning of March, June and at the end of August. The location is the Ainslie Church of Christ Hall located on the corner of Grimes St and Ainslie Ave. We do not meet in November, December or January.